"The Role of Big data analytics in insurance industry"
What is Procure-to-Pay Automation? How do organizations manage business operations through procure-to-pay process? Procure-to-pay automation streamlines all purchasing, accounts payable and related activities electronically. Adopting procure-to-pay technology allows purchasing departments to efficiently spend, have accurate real time pricing with connections to every supplier, online catalogs and tracking. This cloud based procure-to-pay automation system creates efficiency, control, visibility and compliance all in one centralized location. Procurement-to-pay enables businesses to connect with all suppliers online by accessing their catalogs, purchase orders, and viewing real time pricing and receiving. Manage and purchase for capital projects and expenditures. View and report on forecasting and budget impact. Instant budget forecast updates in the system. Purchasing Departments in optimized purchasing and cutting costs. Finance Departments in assessing financial performance, operations and risk management. Information Technology Departments in ensuring customers data security. 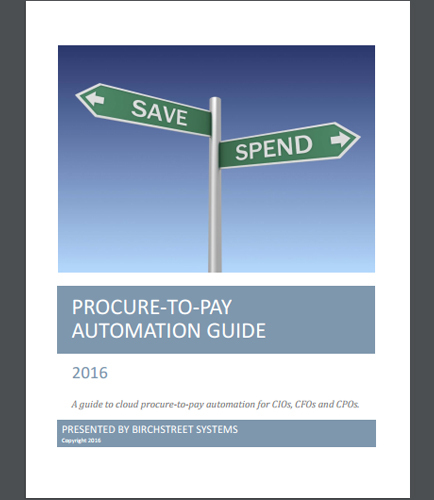 Download this whitepaper and learn more about how BirchStreet Systems has come up with the cloud-based procure-to-pay automation technology through SaaS-based operating and reporting tools to improve business processes by automating eProcurement, AP 3-Way Auto-Match, Inventory Control, Recipe Management System and Capital Budget Management.